Annechovie recently featured Sunny's Goodtime Paints - love these removable wall designs that have a water base adhseive so they're not permanent. They come in a flat finish, so they look like they are painted on. As mentioned on their site, "these are great to decorate an apartment, dorm room, or any space that has to go back to the way it was before! OR if you just like to change your mind without re -painting!" I posted about these walnut tiles back in January. Recently I received an email from Andrea of Thout who is happy to announce that they're finally able to take orders for hallway utiliTILEs! 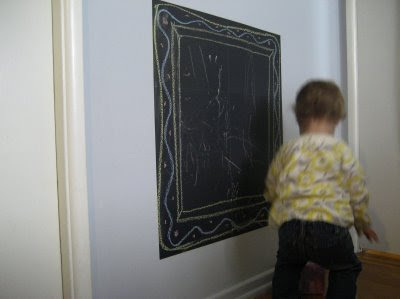 Via Nook Design - Wallies peel & stick chalkboard panels. They are sold as a 4-pack of 9"x12" panels that are repositionable and removable. Nook Design bought two boxes from The Paper Source and used six panels to create the canvas. You can also buy them online at Olive Kids for $15.99 a pack. They come in a choice of Slate Gray, Grape, Blueprint or Schoolhouse Green. 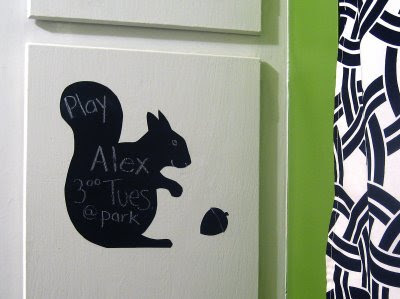 If you would like to make your own wall decals you can take a file to your local sign shop and they will turn it into a wall decal for you using their vinyl cutter. Its very easy and you can have virtually any complex or simple shape cut....type, swirls, birds etc. Ya mean I can actually get away with drawing on the wall! 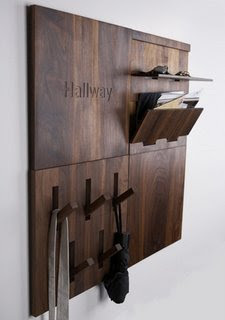 Love these and actually, kids really love a place to design! I love the chalkboard ones .... what a great idea!! !